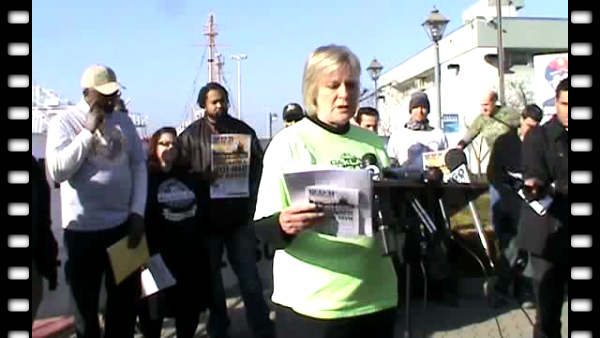 Oakland, California -- Today, rank-and-file workers from the ILWU and Teamsters, local union leaders, veterans, and occupy organizers explained plans for the upcoming West Coast Port Shut Down on December 12 called for by the Occupy Oakland General Assembly. Community pickets and mass mobilizations to blockade the ports are being organized by Occupy movements in San Diego, LA, Oakland, Portland, Tacoma, Seattle, Vancouver, and Houston. Occupy Anchorage, Occupy Denver, and Occupy Wall Street are targeting Goldman Sachs and Walmart on the 12th. Solidarity actions are being planned as far away as in Japan. Longeshoreman in Longview are currently in a bitter fight with the multinational grain exporter EGT, and port truckers in LA are fighting to unionize against Goldman Sachs-owned SSA. While the community pickets of the port are being organized by the Occupy Oakland Port Shutdown Committee, rank-and-file unionists have been actively involved in every level of the organizing. "The rank and file of the ILWU I've talked to say there is no way they are going to cross a community picket line." said Anthony Lavierge, a member of ILWU Local 10. "When I'm working on the port, 90% of the truckers I talk to are enthusiastic." Organizers of the port blockade see the actions planned for next Monday as an important next step for Occupy. In recent weeks, Occupy activists across the country have expanded far beyond encampments and are now targeting large financial institutions, fighting foreclosures, reclaiming public space, and marching on valuable sources of profit for the 1%. “The December 12th port shutdown will be historic. In an unprecedented action we will bring the fight back to the 1% where they make a great deal of profit at the expense of the rest of 99%. We are part of a global movement seeking to take our lives back. In shutting down the ports we act in solidarity, not only with trade unionists under attack, but with the 89% of the working class with no trade union to represent them - the unemployed, the underemployed, the retiree.” said Mike King, an organizer with Occupy Oakland. “This coming Monday, port workers and all workers will stand with the 99%”. Scott Olsen, the Iraq War veteran critically injured by police during a November 25 attack on Occupy Oakland, issued a statement declaring "I plan on standing tall again on December 12, and I look forward to standing with our longshoremen.” He went on to say, “United we are stronger. As you say in your union, an injury to one is an injury to all. The only ones who will tell you otherwise are those that want to continue profiting off your backs." In Oakland, marches to the port will begin at 5.30am at West Oakland BART. At 3pm, there will be a rally 14th and Broadway, followed by a 4pm sharp march to the port. A 5pm march to the port will leave from West Oakland BART.